How to protect your cat: Use monthly throughout the year for continuous flea and tick protection Make sure all cats and dogs in your home are treated regularly. How to treat a home infestation: Follow the 2 steps above as well as the 2 steps below Use a household flea treatment to kill eggs and larvae already in the home. Regularly vacuum your carpets and furnishings. Checklist for using the product: The cat is at least 8 weeks old and 1 kg The cat shows no signs of lesions or feeling unwell. If they show any of these signs, do not apply and see a veterinary surgeon How to apply: Part the fur between the shoulder blades and apply directly onto the skin in two spots 2-3 cm apart. Do not bathe cats within 2 days after application. Can be used in pregnancy and lactation. FRONTLINE Spot On is a veterinary medicine with a robust safety profile. It can be applied to cats from 8 weeks of age that weigh at least 1 kg. It can also be used in pregnancy and on nursing queens. Bathing/shampooing/water exposure does not affect the efficacy of the product as long as it doesn't occur more than once a week. Flammable<br>For external use only<br>For animal treatment only<br>Do not use on rabbits<br>Keep out of the sight and reach of children<br><br>If your cat is unwell, please see your vet for advice before you apply a flea treatment. 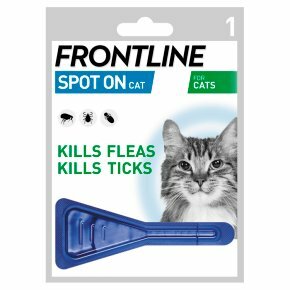 FRONTLINE Spot On for cats is not suitable for use on rabbits.